Destiny is a social game. Community engagement is baked into it at every level, whether that’s the data crunchers on Reddit making spreadsheets of every gun’s time-to-kill, or the YouTubers making funny videos and montages. It looks like the sequel is doubling down on this, with Redditors finding and sharing several easter eggs and secrets from the console beta. Here they all are, and here’s hoping we’ll see even more when the beta comes to PC in August. Check out the game’s flashiest guns with our Destiny 2 exotic weapons guide. Because Destiny’s marketing budget had more money than King Midas and Activision were running low on ideas after bundling an ebony garden trowel with every pre-order, they got Paul McCartney to write them a song. 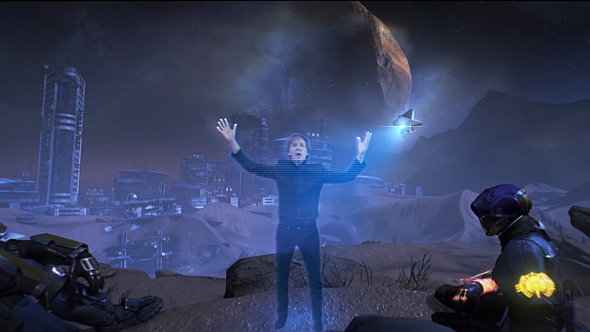 It got a music video, which – unwisely, in my view – features holograms of Sir Paul singing to Guardians in the Tower, on the Moon, on Venus, and so on. All in Destiny’s engine, which looks weird. Even if the song hadn’t been pretty melodramatic, it’s all a bit misjudged. Destiny YouTuber MyNameIsByf found thisreallyinteresting secret in the new social space, The Farm, with the help of the GetWrecked clan. It seems the computer terminals there are broadcasting signals in morse code, but they’re not the easiest to deciper, because it’s not clear where how they’re meant to be spaced out. So, depending on how you do that, the signals translate to either 26T or IOM4. As Byf points out, ‘Io’ is one of the main destinations in Destiny 2, but nothing else about these translations leaps out. Perhaps this is the start of an ARG, and more clues are incoming? We’re getting an upgrade in Destiny 2, with proper goals and everything, but social spaces in the original game had physics-enabled balls to kick around as you waited for your mate Sam to finish clearing his backlog at the Postmaster. Dammit, Sam. Anyway, just because the Tower is a Super Serious Warzone in Destiny 2’s first mission, that’s no reason for Bungie to break continuity and remove a thing like that, however jovial our memories. Indeed, the condition of the beloved, shiny, purple ball in Destiny 2 is the ultimate symbol of everything we lose when Ghaul attacks our home. Look closely during the Homecoming mission, and you’ll find it, punctured and forlorn, on the steps of the Tower plaza, just to the right of Zavala. Here’s the image on Imgur. This is Destiny 2’s first public event, which came to our attention thanks to Omguscat on Reddit. You know those Vex launchers in the Inverted Spire strike? Head to the right of the area, across the waterfall, and near the door which everyone thinks leads to the Lost Sector (see below). Eventually, two special Quantum Hobgoblins will spawn near that door, along with a depowered Vex launcher. YouTuber Rick Kackis has a video guide above. Kill the Hobgoblins to power the launcher and hop aboard – this starts you on a train of launchers that you’ll need to power by killing Hobgoblins. Eventually, it’ll drop you where you started, but there are new enemies now, called ‘Storm Minotaurs’. Killing them will recharge the same loop of Vex launchers but it’ll be much tougher. Omguscat reports that the loop will end after the final Minotaur… and nothing will happen. But who knows what this will do in the full game? Omguscat’s guess that it’ll open the Lost Sector door seems likely. See that? That’s where Tyra Karn, the Cryptarch, will hang out in Destiny 2. For newcomers, Cryptarchs ‘decrypt’ engrams, which are defined in the lore as data without matter. In practice, they’re undetermined pieces of loot dropped by bad guys, which the Cryptarch then turns into useable weapons or armour. Anyway, look at the red curtain between the minimap and the diamond-shaped Cryptarch symbol. It seems someone at Bungie forgot to make it solid during the Farm’s one-hour trial, as players discovered they could jump through it and into a secret room full of unfinished textures. Here’s a clip, courtesy ofUlti on YouTube. The question now is what will happen to the secret room in the finished game? The obvious answer is to solidify the curtain and make it undiscoverable, but that’s no fun.This Reddit threadhas a few suggestions, of which my favourite is adding 99 purple balls to make both a purple ball pit and a slam-dunk for the first YouTuber to remix 99 Red Balloons. As this article should hopefully have proven, Bungie love easter eggs and memeable content, so I’d say we’re in with a chance. Almost all of the loot that dropped in the Destiny 2 beta was legendary (purple) gear in a final (non-engram) state…almostall. Two Xbox One players have posted evidence of blue engrams dropping from the boss at the end of the Inverted Spire strike, in incidents so rare that they are apparently bugs. Normally a blue engram would be nothing to shout about, since they’re of lower quality than purples, but in this context they’re huge outliers. The engrams decoded instantly once picked up – BlackJesus71450 got a Warlock bond named Fatum Praevaricator, and LegendRebornHD got an auto rifle named Refrain-23. You can check out the former via these Xbox shares, and the latter in this video byUnknown Player. In both cases, the blue gear has a higher power level than 200, which is the rating of all the purple gear in the beta. Don’t read too much into this, however; we don’t know what the power cap in the finished game will be, and I’ll eat a Cabal if the cap on blue gear drops is higher than that on purple gear. In the original Destiny, if you earned a piece of loot but had no space in your character’s inventory to receive it, it would go to the Postmaster in the Tower for you to collect at your leisure. Your inventory tended to fill quickly after a spell in the strike playlist or in the Raid, so this happened often, but you’d have no idea when, since there was no notification. Well, no longer;Redditor Dm3cixplayed enough of the Destiny 2 beta to fill one of his characters’ inventory slots, and then to earn another drop on top of that. A handy pop-up then told him that his new Retrofuturist was waiting for him in the post. So no more wondering if that last piece of Raid gear finally dropped! This is a nice quality-of-life change that veterans in particular will appreciate. And now, time for some good old-fashioned geometry glitching. Given how often it happened in the original, Bungie must’ve expected something like this. While playing the Inverted Spire strike in Destiny 2’s beta,YouTuber StrandedKenni glitched into a part of Nessus’s mapthat he clearly wasn’t intended to see. The first 12 minutes of the video above shows him navigating misaligned and blinking geometry before arriving in a coherent cylindrical chamber. It has no enemies or objectives, but there are two notable features: a big triangular door, much like the one sealing the final boss room in the Vault of Glass raid from the original Destiny, and a manhole-like plate on the floor. Identical plates function as teleporters elsewhere in the Inverted Spire strike, and the exterior of the triangular door is visible from the surface of Nessus with some stairs leading up to it. StrandedKenni’s hypothesis is that this is one of Destiny 2’s Lost Sectors – new PvE mini-dungeons that you’ll discover in the open world. From what we know of them so far, that’s certainly possible. The second of these isdefinitelya Lost Sector though, because it begins at one of the in-world graffiti tags that denote them. YouTuber KingFuzzyDiamonds has found a way into what he thinks is that Lost Sector, and he takes you through it in the video above. If you want to follow in his footsteps, you’ll need to be a Dawnblade Warlock, because the route relies on their mid-air dodge ability (if you didn’t know, Dawnblades can dodge in mid-air, much like Titans with the Twilight Garrison armour piece could in the original game). If you want to check out the dungeon itself, skip ahead to the last 50 seconds or so, when KingFuzzyDiamonds lands in a space that makes physical sense again. It’s a claustrophobic cavity in Nessus’s rock, vaguely reminiscent of parts of the Vault of Glass. Indeed, there aren’t many open spaces at all – perhaps more will be opened up in the final game, but as it is, a boss fight in such a confined space would be an exceptional one. Though players were only allowed to spawn in to the Farm for an hour, they were never actually kicked out once there, and many chose to hang around. Why? Partly to look for secrets, but also because it’s just a nice place to be. We picked out two videos made by players who chose to highlight its beauty. Thanks to Gad Zooks (above), you can watch dawn break across the water, lighting up one of Bungie’s famous skyboxes in a genuinely quite breathtaking display of digital beauty. Bo Solaris (below) provides another angle, with a view of the swirling storm around the Traveler’s Shard. An honourable mention toGhStRdR2k, who hung around in the Farm for15 hours “just in case the Cabal decide to try anything crazy while everyone is away.” How’d he spend the time? Kicking the soccer ball into silly places. Here’s a chronicle of his achievements, courtesy of Imgur. In one of the more interesting glitches from the beta, Dark_Assassin00 reports on Reddit that, after queuing for a game of Control, his eight-person lobby were taken instead to the Inverted Spire strike. Here’s the video on YouTube. Disappointingly, they were stuck in its first room and unable to progress. Humanity once tried to colonise Nessus, and the proof can be seen before you enter the Inverted Spire strike: here’s the wreckage of an ill-fated colony ship, like those found in the Cosmodrome in the original game. For a closer look, check out this video guide by KingFuzzyDiamonds on YouTube.